Rihanna‘s partnership with Puma has resulted in more than enough interest from female sneakerheads the world over. The German lifestyle brand has obviously focused more on the lifestyle category with the famous songstress as their new creative director, and the latest collaboration will definitely turn heads. The Rihanna x Puma Fenty Trainer is a high-arching silhouette full of noteworthy design cues, from the sky-high tongue construction to a slip-on upper complete with bolstered mesh panels for a futuristic look. Three monochromatic colorways are hitting retailers later this Spring 2016 season in a vibrant all-red, a clean white-on-white, and murdered out matte black. Which are you a fan of? Check out a detailed look below and stay tuned for an official release date right here on Sneaker News. 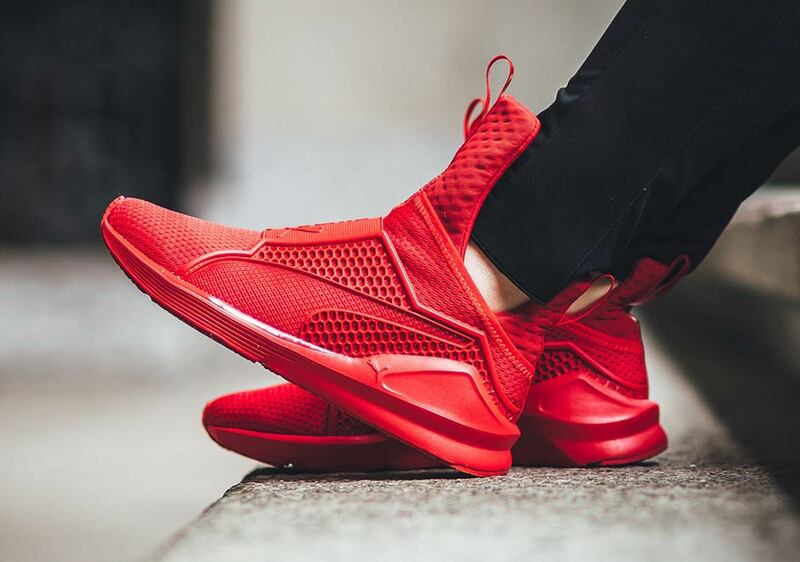 The post A Detailed, On-Foot Look At Rihanna’s Puma Fenty Trainer appeared first on Sneaker News. Aside from its recent iteration with monkey time, this ALIFE x Puma Blaze Of Glory is one of the more notable standouts from the brands’ second collaboration for Spring/Summer 2016. Rendered in a multicolor makeup, the majority of its build is shaded in grey, while hits of violet and purple are applied on the rear portion and frontal section of its eyelets. Accents of blue coral are also evidenced on the tongue tab and sides, in addition to touches of orange located on the pull tabs and heel as well to further pronounce the palette. All resting atop a black-colored Trinomic sole unit with white speckling, you can purchase this pair at select Puma retailers worldwide now. The other offerings from this collab is alright, but this pair is the most recognizable in my opinion. I’m a fan of the silhouette as well. The post Color Blocking On The ALIFE x Puma Blaze Of Glory appeared first on KicksOnFire.com. Following quilted leather iterations, this ALIFE x Puma States consists as a standout variation of the silhouette for Spring/Summer 2016. Maintaining its simplistic profile, the low-top is predominantly shaded in light tan, with the majority of its upper comprised of hairy suede. To punctuate the classic style, a vibrant red/yellow/black snakeskin leather formstripe is applied on the sides, while it’s also visible on the heel tab. All resting atop a clean white rubber sole unit to complement its palette, finishing touches include light grey laces, inner lining and gold branding imprinted on the side panels. Additionally, classic green/black branding is also embroidered on its tongue tabs to round out its design details. You can purchase this pair at select Puma retailers now. I’m a fan of the model’s clean design overall. This colorway is certainly appealing, but that vibrant detail on the sides isn’t that great. It’s alright. The post Exotic Detailing On The ALIFE x Puma States appeared first on KicksOnFire.com.